Rejang Dewa dance is performed by female dancers with gentle and simple movements. This dance is usually accompanied by musical instrument of Gong Kebyar or Gong Gde and also Gamelan Selonding in some areas. A beautiful traditional dance blends in the strains of gamelan music and fragrant incense, truly charming and magical. The Rejang Dance itself is thought to have existed since the Pre-Hindu era. There are many different types of Rejang Dance and one of which is Rejang Dewa Dance (Tari Rejang Dewa). The Dewa dance is usually done in groups or mass. The dancers can be from: prepubescent girl, young female and also post-menopausal women. The dance is believed to hold important spiritual values and performed with great devotion. This dance is quite difficult for visitors to see. This is one of the sacred dances (Wali Dance) which is indeed limited only to be used during a ceremony in the temple (odalan). Rejang Dewa is usually danced in the innermost courtyard (jeroan) of the temple. This dance has an important role in the implementation of a ceremony. The dancers are said to be the "bidadari" (heavenly maidens) come to earth. This dance is indeed supposed to welcome the god to bestow prosperity, sustenance, and protection on Earth. The dance is not danced by special (professional) dancers. In the performance, there are usually several guiding people called "Pemaret", dancers who have experience in dancing the dance. Pemaret are usually in the front row so that beginner dancers can follow their movements. Rejang Dewa is usually taught from generation to generation so that the skill in dancing this dance does not stop. This dance starts with slow movements and gradually follows an increasing tempo. At the end they form a circle and hold waist scarf from the dancer in front of them. The costume and makeup have an important role in dance performances. The dancers wear costumes that are dominated in white and yellow. While the makeup is more simple and natural. At the top, the dancer's hair is arranged in such a way and is wearing a crown made of coconut palm fronds decorated with marigold flowers. While at the bottom, dancers wear tapih cloth, the cloth used on the inside. This is a white cloth, and the bottom is decorated with a yellow gold motif. Then the tapih cloth is coated with a sheet of white cloth. The prada belt wraps around from the waist to the chest and wears a yellow scarf. Note: There are sources that mention Rejang Dance has been around for a long time with many types such as: Rejang Renteng, Rejang Bengkel, Rejang Ayodpadi, Rejang Galuh and more. Then in 1988, Ni Luh Swasthi Wijaya Bandem of STSI choreographed a new version that combined movements of many types of Rejang, called Rejang Dewa. 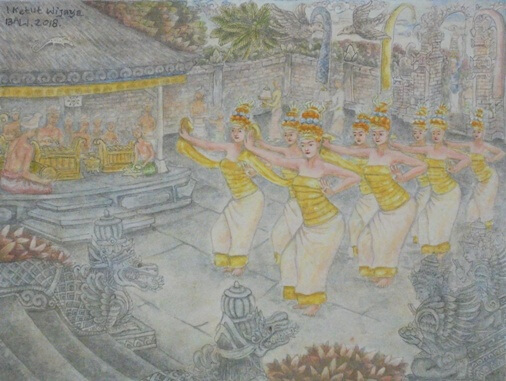 The dance has become almost “de rigeur” (de rigueur: required because of etiquette) in many temples since the 1990s (I Wayan Dibia; Rucina Ballinger, 2012). Dibia, I Wayan; Ballinger Rucina. (November 2012). "Balinese Dance, Drama & Music: A Guide to the Performing Arts of Bali". Tuttle Publishing. ISBN: 1462908675, 9781462908677. Accessed on November 20, 2018.